As we approach the final days of this year, we would like to say thank you to everyone who supported or attended an Open Knowledge event and helped to build on the ideas and actions for a more open government and an Irish open data agenda that has the citizen at its forefront. 2016 has been an extraordinary year for Open Knowledge Ireland – It was a year in which we dared to ask for Irish hospital waiting lists to be published as open, accessible data and we have achieved this right before everyone went on their well-deserved Christmas holidays (Link). We have been advocating that for open data to be useful and to make a difference in the lives of people it has to be put in use. In order for businesses, civic groups or individuals to invest their time, talents and money into making open data useful, it must be seen as a digital public infrastructure and it must be permanent, linkable and trustful. The Open Knowledge volunteer team organised and participated in events, tried out new technologies and demonstrated the usefulness of open data. In FEBRUARY we shared our open data experiences [slides] and vision [slides] for long-term knowledge preservation with a delegation from NTT, Japan, which was visiting Dublin. In MARCH the Open Government Partnership Mid-term report on the progress of the Irish National OGP Action Plan was launched. In JUNE we held an event dedicated to the preservation of an ever increasing amount of knowledge created by humankind today for generations of the future. In JULY we were kindly invited by Graeme Jones to the Isle of Man to share our open data experiences at the #offcamp unconference. We took this opportunity to highlight the importance of trust in data. In AUGUST we helped to map the Kingdom of Lesotho at an event dedicated to the 10th anniversary of the open street map which was kindly hosted by the Embassy of the Kingdom of Lesotho in Dublin. In SEPTEMBER and continuing to December we contributed to the second Irish Open Government Partnership National Action Plan ensuring that plans are shared with a wider audience. Alongside a host of other organisations, individuals and companies we made several submissions to the drafting of the OGP Action Plan and in 2017 we are looking to help establish a set of guidelines for citizen participation in order to build an appropriate accountability mechanism for its implementation. In OCTOBER we co-organised a half-day workshop together with the Institute of Public Health dedicated to “Open Access: Tackling Health Inequalities”. The outcomes of the workshop showed that the technological advances of today are giving rise to a growing catalogue of international best practices and opportunities for making knowledge universally fair, accessible, interoperable and reusable. 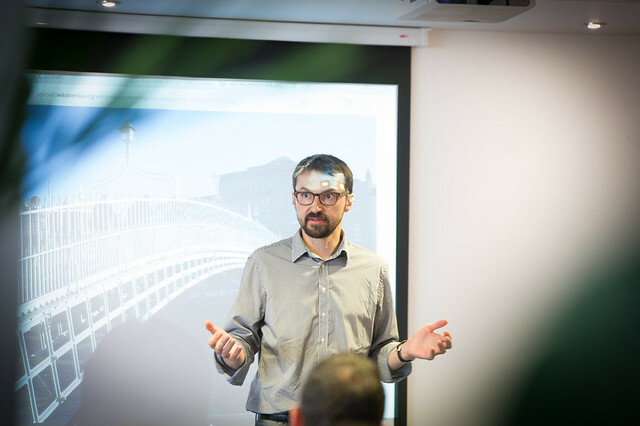 In NOVEMBER our colleague Dr Ingo Keck delivered a presentation on the challenges the open data agenda faces today. At an event in Berlin dedicated to World Usability Day he raised important questions about the sustainability of open data beyond today and tomorrow. In 2017 the Open Knowledge Ireland team are going to focus their energy on Healthcare data and making it relevant and useful to the Irish people. Our team will concentrate on planning and running 4 events looking to closely work together with DPER’s Open Data Engagement plan, the NTPF, and the HSE and continue to demonstrate how open data can save real world problems. We have a long way to go until Open Data will become a critical public infrastructure in Ireland and beyond: permanent, linked and secure. Open data must be accessible, interoperable and findable in order to help a real person to make decisions on daily basis. It is clear to us that such an infrastructure needs to be designed, built and maintained, which requires human and financial resources. So in 2017 we want to do a whole lot more and we would love if you might contribute a small gift to help us do that. Your support will help every element of our work in the new year, and support Open Knowledge Ireland as a hub for individuals, organisations and their ideas that form a major driving force of the open data and open government agenda in Ireland. And we look forward to seeing you at Open Knowledge events and initiatives many times in the New Year. With thanks to our Open Knowledge Ireland colleagues: Flora, Salua, Ingo, Adrian, Shawn, Stan, Eugene and Denis. And many thanks to our everyone who collaborated with us in 2016, especially Open Street Map Ireland, WikiMedia Ireland, the Institute of Public Health, TCube, and the Science Gallery.